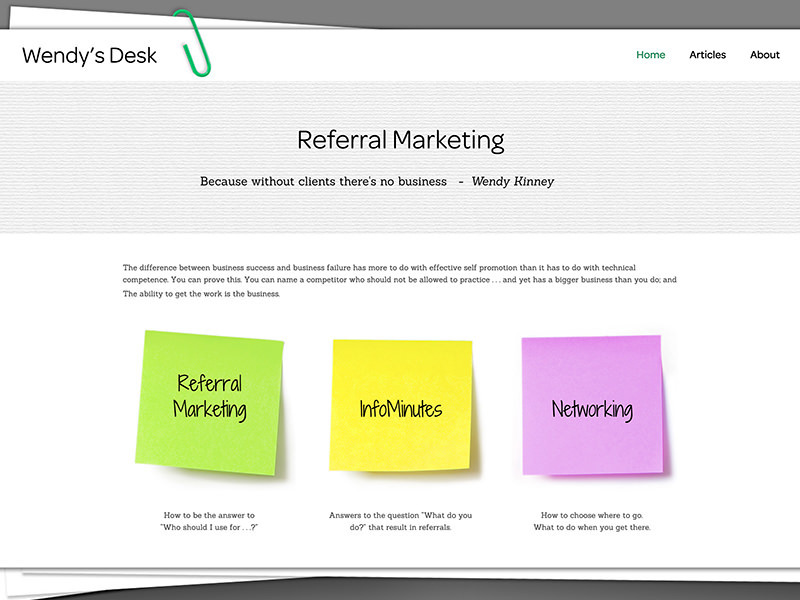 Referral marketing guru Wendy Kinney contracted me to help her consolidate her Wordpress blogs into one new home on the Squarespace platform. Wendy said she had found Wordpress less than intuitive to use, and as a result, she had not been blogging as much as she would like to. Having tried a couple of different Wordpress blog themes (and locations), she had ended up with a disparate collection of posts across two different sites, and wanted to move everything into one more manageable place. As part of the move, Wendy also wanted to simplify the design of her blog to make it feel approachable and easy for her business audience readers to explore. As an incredibly prolific writer, there are dozens of nuggets of really useful advice about marketing and building a successful business, so we wanted to ensure maximum visibility for a wide range of posts. As the name of her blog is Wendy's Desk, the design is inspired by business stationery: paperclips, Post-it notes and different textured papers. We worked together on coming up with an adaptation of the Bedford template that would satisfy Wendy's need to expose more blog posts across multiple categories in an accessible way. We used an Index homepage with Post-it notes that anchor further down the page to different sections, one per category. Within each section, 4 posts from that category are showcased - and as a nice extra touch, Wendy is using tags to indicate how long each post is (for example, 3 min read). This makes it easy for her busy clientele to skim through dozens of blog posts, to hone in on the one that appeals and that they have the time to read right now. We also make use of shortcuts in the top navigation to direct visitors to filtered lists of blog posts for each category, for people who prefer to navigate using traditional means. This project has been a slow burner thanks to my crazy book schedule (thank you Wendy for being so patient! ), but I'm pleased to see it released into the wild. Up next: getting Wendy onto the Squarespace apps to make blogging even easier... I bet she can whip out 5 posts a day then! - I guarantee you'll find something useful to build your business (I have learned loads from her already).